Now, when the motor is at rest, obviously, the back emf Eb = 0. Hence, armature current at the moment of starting can be given as Ia = E / Ra. In practical DC machines, armature resistance is basically very low, generally about 0.5 Ω. Therefore, a large current flows through the armature during starting. This current is large enough to damage the armature circuit. the fuses may blow out and the armature winding and/or commutator brush arrangement may get damaged. very high starting torque will be produced (as torque is directly proportional to the armature current), and this high starting torque may cause huge centrifugal force which may throw off the armature winding. other loads connected to the same source may experience a dip in the terminal voltage. A large DC motor will pick up speed rather slowly due to its large rotor inertia. Hence, building up the back emf slowly causing the level of high starting current maintained for quite some time. This may cause severe damage. To avoid this, a suitable DC motor starter must be used. Very small dc motors, however, may be started directly by connecting them to the supply with the help of a contactor or a switch. It does not result in any harm because they gather speed quickly due to small rotor inertia. In this case, the large starting current will die down quickly because of the fast rise in the back emf. To avoid the above dangers while starting a DC motor, it is necessary to limit the starting current. So, a DC motor is started by using a starter. There are various types of dc motor starters, such as 3 point starter, 4 point starter, no-load release coil starter, thyristor controller starter etc. The basic concept behind every DC motor starter is adding external resistance to the armature winding during starting. From the followings, 3 point starters and 4 point starters are used for starting shunt wound motors and compound wound motors. The internal wiring of a 3 point starter is as shown in the figure. When the connected dc motor is to be started, the lever is turned gradually to the right. When the lever touches point 1, the field winding gets directly connected across the supply, and the armature winding gets connected with resistances R1 to R5 in series. During starting, full resistance is added in series with the armature winding. Then, as the lever is moved further, the resistance is gradually is cut out from the armature circuit. Now, as the lever reaches to position 6, all the resistance is cut out from the armature circuit and armature gets directly connected across the supply. The electromagnet 'E' (no voltage coil) holds the lever at this position. This electromagnet releases the lever when there is no (or low) supply voltage. It can be seen that, when the arm is moved from the position 1 to the last position, the starter resistance gets added in series with the field winding. But, as the value of starter resistance is very small as compared to the shunt resistance, the decrease in shunt field current may be negligible. 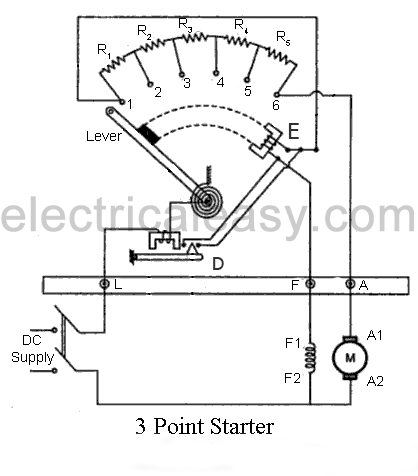 However, to overcome this drawback a brass or copper arc may be employed within a 3 point starter which makes a connection between the moving arm and the field winding, as shown in the figure of 4 point starter below. When the motor is overloaded beyond a predefined value, 'overcurrent release electromagnet' D gets activated, which short-circuits electromagnet E and, hence, releases the lever and the motor is turned off. The main difference between a 3 point starter and a 4 point starter is that the no voltage coil (electromagnet E) is not connected in series with the field coil. The field winding gets directly connected to the supply, as the lever moves touching the brass arc (the arc below the resistance studs). The no voltage coil (or Hold-on coil) is connected with a current limiting resistance Rh. This arrangement ensures that any change of current in the shunt field does not affect the current through hold-on coil at all. This means, electromagnetic pull of the hold-on coil will always be sufficient so that the spring does not unnecessarily restore the lever to the off position. 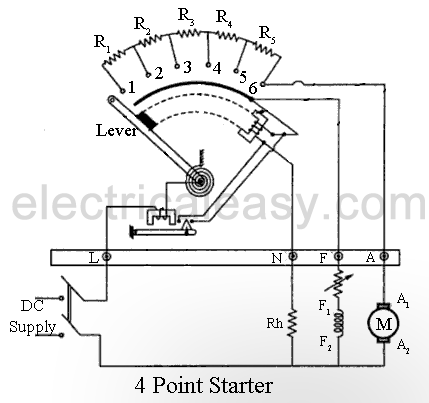 A 4 point starter is used where field current is to be adjusted by means of a field rheostat for the purpose of operating the motor above rated speed by reducing the field current. Construction of DC series motor starters is very basic as shown in the figure. The start arm is simply moved towards right to start the motor. Thus, maximum resistance is connected in series with the armature during starting and then gradually decreased as the start arm moves towards right. This starter is sometimes also called as a 2 point starter. The no load release coil holds the start arm to the run position and leaves it when the voltage is lost.